AUSTIN  Cedar Park Timberwolves defeated the Crosby Cougars 49 to 21 last Friday before a majority of red-shirted Cougar fans in the stadium cheering them on and ringing cowbells. It was for the 5-A Semifinals at the Darrell K. Royal  Texas Memorial Stadium. Early confidence changed to reality as the game progressed. The French had it before Waterloo, the Confederates before Picketts Charge at Gettysburg and the Cougars had it in the first quarter when they were ahead of the Timberwolves 14 to 7. It was the second quarter that defeated the Cougars, out scored 28 to 7 that quarter, the impact of big players, six feet seven inches and six feet nine inches tall eventually wore down the intrepid and daring local players. The Cougars opened with a 68 yard drive in 9 downs. DOntal Allen dashed in 17 yards to begin the scoring. Then Tristen Cotten connected with Emmanuel Netherly in the end zone for a 21 yard pass. Tristen Cotton was on target for all seven of his first passes but was 19 complete for 24 attempts with one interception on the night as Crosby began to grasp for fourth down conversions during the second half. He had 146 yards by the throw. The Timberwolves would answer by breaking tackles in the backfield and dashing for 80 yards. That followed by a 39 yard touchdown blitz would tie the score. Crosby fumbled and it was returned for 36 yards to score the go ahead touchdown with four minutes left in the half. Carlos Grace would tie the game again with a 17 yard run after Tristan Cotton hit three different receivers for hard earned yardage. As time and down pressure mounted and Cotton was picked off in the early third quarter, it seemed all the momentum went to the Timberwolves. They would make seven touchdowns. Crosby Leading receiver was Trevor Larkin with 6 for 48 yards. 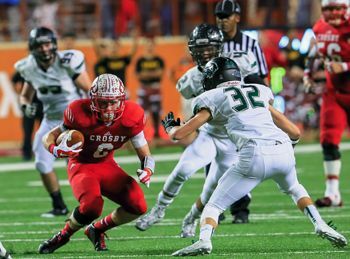 Crosby had 151 yards passing to 8 for Cedar Park. Carlos Grace was Crosbys lead rusher with 12 for 84 yards and a touchdown. DOntal Allen ran 11 times for 76 yards. The Timberwolves averaged 53.5 points in four play-off games. They are here for the fourth time in the last five seasons and were state champions in 2012. Coach Jeff Riordan shares The Touchdown Club of Houstons Coach of the Year with Corby Meekins of Westfield.